Our company was founded by Metalna d.d. (from Maribor, SLO) and Schiess AG (from Düsseldorf, Germany) in 1990. The newly founded company was originally named Schiess-Metalna Ltd. In 1993, the Doerries-Scharman AG (Germany) acquired Schiess AG’s shares of the company. After 1995, the current shareholders acquired the company and registered the company’s short name. 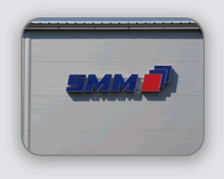 Now, SMM Ltd. independently implements the business and program development. In cooperation with our partners and customers, we produce finished, ready-to-use products and projects from the field of mechanical engineering, automation and informatics. Our experience, knowledge, development power and adaptability allow us to successfully fulfill the expectations of our clients.